This recipe is one of the easiest for recreating the German bread experience. It uses half white and half whole wheat flours, some sourdough for taste, and caraway seeds. Two rises make this bread light and easy to slice. It's perfect for serving with soup or for Abendbrot. This bread freezes well. Makes one, large Bauernbrot "Laib" or loaf. 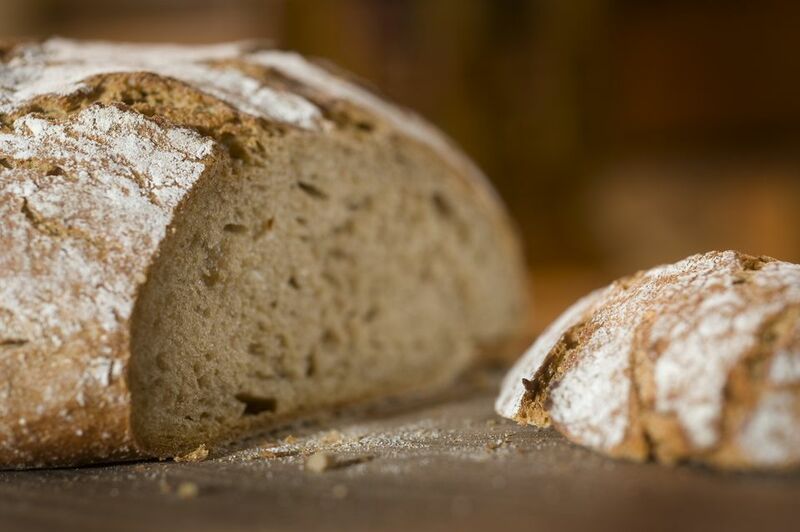 Note: while there are multiple steps to this recipe, this German farmer's bread is broken down into workable categories to help you better plan for preparation and baking. Mix flours, oats, salt, caraway, and instant yeast together in a large bowl. In a small bowl, mix together the milk and vinegar to create a sour milk. Add the sour milk, yogurt, and sourdough culture and begin mixing. This is easier if you have a stand mixer, but you can do this with a large spoon, too. Mix until dough forms a ball, adding water if needed. The dough should be slightly sticky. Continue kneading, either with the mixer or on a lightly floured board for 5 to 7 minutes. Let the dough rest for 5 minutes, then knead again for 1 minute. Form into a smooth ball and place in an oiled bowl, turning to coat the top. Cover with a clean dish towel and let rise in a warm place until doubled. Turn out onto a lightly floured board and pat dough into a rectangle. Indent with fingertips down the middle. Fold one-third to the middle, lengthwise, pulling dough taut on the bottom. Press seam a little to seal. Fold other third to the middle (pulling dough taut) and pinch the seam closed. Roll over, seam-side down, and rock gently while rounding the ends to make the loaf longer or fatter, as you wish. Place on parchment paper on a baking sheet or cardboard, dust top with flour, and let rise until doubled. About 30 minutes before you plan on baking, slash the top with a sharp razor blade or lamé at least 1/4-inch deep. Heat oven to 500 F for 1 hour prior to baking. Use a baking stone if you have it, according to manufacturer's instructions. Otherwise, place an old pan on the bottom rack and set the second rack in the middle. Place the bread on the middle rack (still on the parchment or floured baking pan), pour 2 cups of hot water into the old pan and close the door. Using a spray bottle filled with water, spray the sides of the oven after 2, 5, and 7 minutes. Turn oven down to 450 F and bake for 20 minutes. Turn oven down to 350 F and bake for another 20 to 30 minutes, or until a temperature probe measures 190 to 200 F or loaf is brown and sounds hollow when tapped. Remove and let cool 2 hours before slicing. Enjoy along with your favorite soup or sandwich. To make sourdough culture beforehand, use a great sourdough starter recipe. The sourdough culture used in this recipe was started with Goldrush sourdough starter fed and then refrigerated one day prior to use. It was taken straight from the refrigerator and mixed with the other ingredients immediately.